(CNN) -- A video that TMZ alleges is of Beyonce's younger sister having an altercation with the superstar's husband, Jay Z, has surfaced online. In 1998, Beyonce, second from right, was known simply as another member of Destiny's Child, a four-member girl group who released a self-titled debut that year and had a breakthrough with the remix of their single "No, No, No, No." Beyonce performs with Kelly Rowland, left, and Michelle Williams -- the final version of the group that put her on the map -- for President-elect George W. Bush during a pre-inaugural event in Washington on January 19, 2001. When Beyonce took the stage in Melbourne on April 29, 2002, she was just a year away from releasing her first solo album, "Dangerously In Love." In November 2002, before they tied the knot, Jay Z and Beyonce fueled rumors that they were dating by becoming musical collaborators. 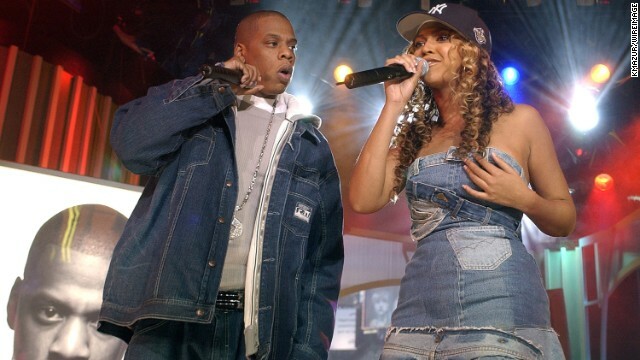 Beyoncé appeared on Jay Z's 2002 single "03 Bonnie & Clyde," and he appeared on her single "Crazy In Love" the following summer. A decade before she wowed viewers at the 2013 Super Bowl Halftime Show, Bey jammed with Carlos Santana during the Super Bowl XXXVII Pregame Show in San Diego on January 26, 2003. Having stepped out on her own, Beyonce presents the humanitarian award to Michael Jackson at the 2003 Radio Music Awards in Las Vegas on October 27, 2003. The singer is affectionately referred to as Queen Bey, not in the least because of her heralded work ethic, which is often put to good use on stage. Here, she performs during the 2003 MTV Video Music Awards in New York on August 28, 2003. 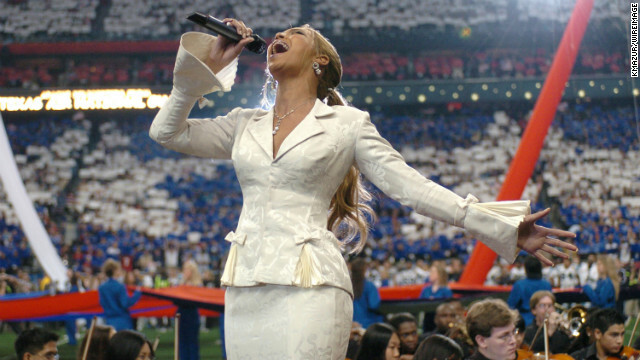 Beyonce was right back at the Super Bowl in 2004, performing the national anthem to kick off Super Bowl XXXVIII on February 1. 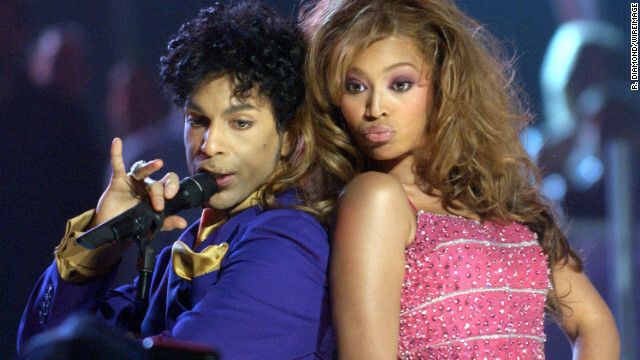 At the 46th Grammy Awards Show in February 2004, she joined Prince on stage to perform a medley of his hits. She left the ceremony with five Grammys in hand. 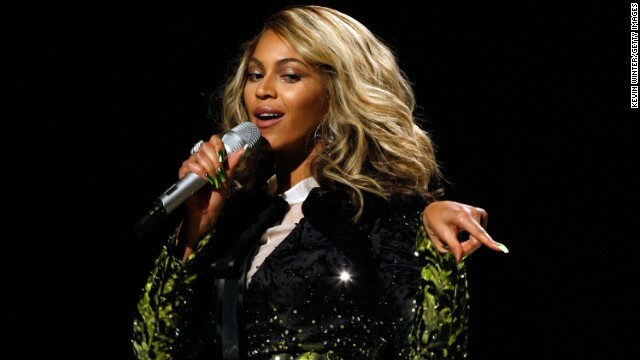 Although her solo career had taken off by 2005, Beyonce still performed with Destiny's Child that year in Sydney on the heels of their 2004 album, "Destiny Fulfilled." After releasing another best-seller with 2006's "B'Day" and starring in "Dreamgirls" that same year, Beyonce was readying to release a third solo album, "I Am ... Sasha Fierce" when she took the stage at the 50th Grammy Awards Show on February 10, 2008. Somehow, she snuck in a secret marriage to Jay Z that April. Beyonce during the filming of her hugely popular music video "Single Ladies (Put A Ring on It)." In 2011, Beyonce stole the show at the MTV Video Music Awards when she walked the red carpet and, with the careful placement of her hands, revealed that she was expecting. 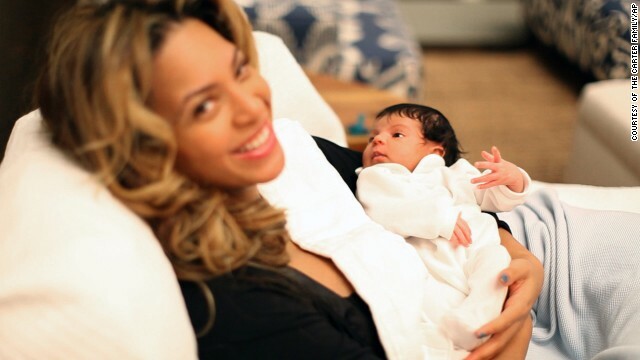 The star and husband Jay welcomed Blue Ivy in January 2012. When Beyonce's daughter with Jay Z, Blue Ivy, was born in 2012, the couple shared a photo of their newborn on their website. A hand-written note accompanying the photos reads, "We welcome you to share our joy." Just months after giving birth, Beyonce was red-carpet ready at the Costume Institute Gala at the Metropolitan Museum of Art in New York on May 7, 2012. Beyonce found herself at the center a firestorm in 2013 after it was revealed she used a "backup track" to sing the national anthem at the inauguration of President Barack Obama on January 21. 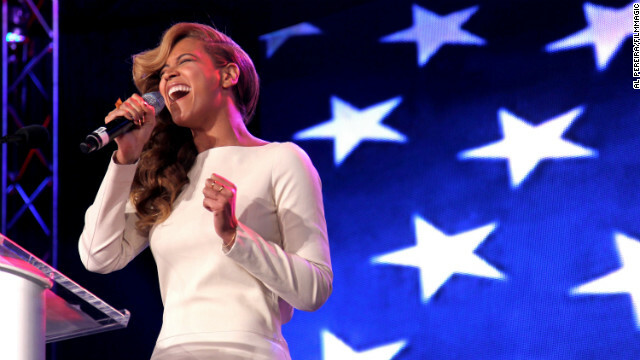 After the inauguration dust-up, Beyonce had something to prove when she held a news conference for her Pepsi Super Bowl XLVII Halftime Show on January 31. After belting out "The Star-Spangled Banner," the singer paused and turned to the press and asked: "Any questions?" Kelly Rowland, Beyonce and Michelle Williams reunited as Destiny's Child to perform during the Super Bowl XLVII Halftime Show on February 3, 2013, in New Orleans. In early April 2013, the singer and her husband were once again the subject of critical headlines when they took a trip to Cuba to celebrate their fifth anniversary. In May 2013, Beyonce was the subject of pregnancy rumors as observers noted that her dress to the Metropolitan Museum of Art's Costume Institute Gala conveniently covered her midsection. The speculation grew stronger after she had to cancel a concert due to exhaustion and dehydration. She denied that she was pregnant. 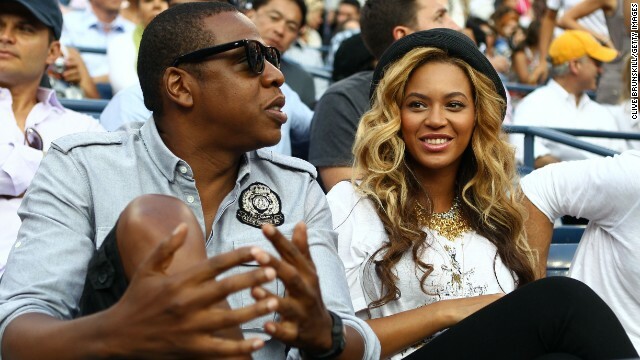 In September 2013, Jay Z and Beyonce once again topped the Forbes list of biggest-earning celebrity couples. In December, Beyonce stunned fans by releasing a surprise "visual album." The project was well-received and shot to No. 1, spawning platinum hits like the single "Drunk In Love." Beyonce performs "Drunk in Love" at the 56th Annual Grammy Awards in Los Angeles on January 26. 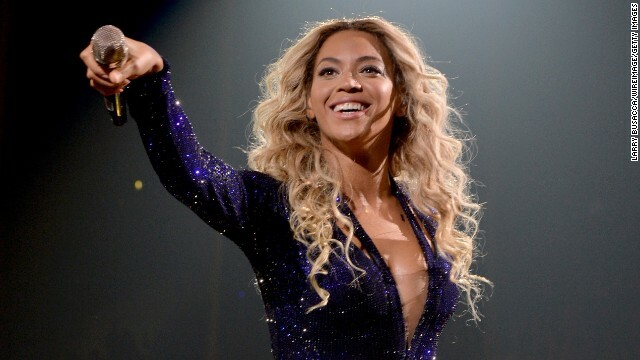 Time magazine has praised Beyonce as an industry tastemaker. In April, the magazine called Bey one of the 100 most influential people in the world. 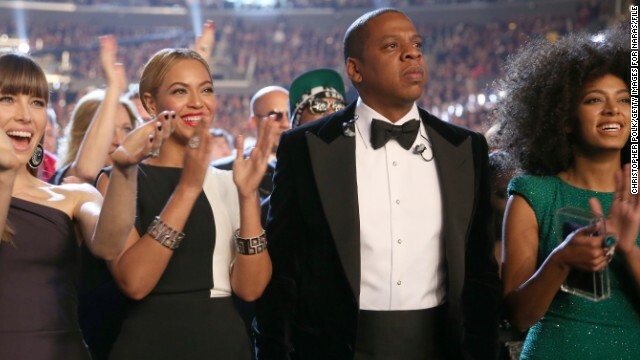 In May, Beyonce found herself literally caught between her husband and her sister, Solange Knowles, who is seen here at the far right. A video of an alleged fight between the rapper and his sister-in-law surfaced online, marking a rare dark moment in Beyonce's otherwise golden life and career. After Jay Z's infamous scuffle with Beyonce's sister, the power couple faced numerous rumors that their relationship was on the rocks. 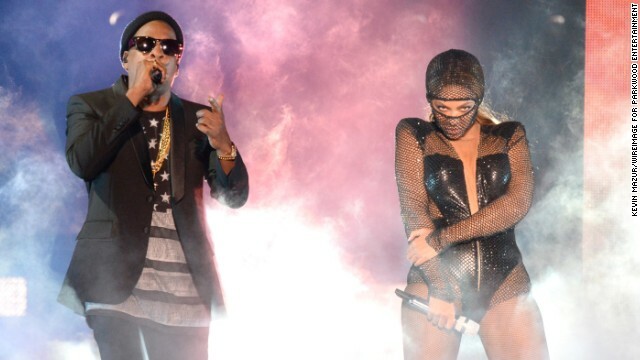 But when they started their joint "On the Run" summer tour in Miami on June 25, they held a united front, playing their never-before-seen wedding video and showing footage of daughter Blue. At the 2014 MTV Video Music Awards, Beyonce was awarded with the Michael Jackson Vanguard Award, which is given to "exemplary musicians who have made an incredible and long-lasting impact on pop culture." 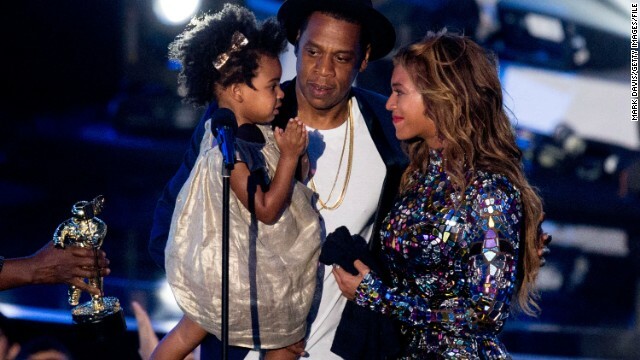 The singer accepted the award on August 24, 2014 from her husband, Jay Z, and daughter, Blue Ivy. Jay Z must have shown Solange her album sales on a line graph. HLN's Marc Balinsky contributed to this report. CNN first learned of the alleged fight video from Twitter.